When Mildred Bevins dies, her children learn that if they want a piece of her estate, they must return to the Homeplace in Missouri where they grew up ~ and commit to staying for two years. All four children return, along with their spouses and their own children, to work the family farm. As they try to get acclimated to this new life in their hometown, the teens of the family are also struggling with growing up and fitting in. Back to the Homeplace by William Leverne Smith takes place in 1987, and the author includes brief news blurbs at the start of each chapter to remind us of the big events happening in the world that year ~ from talks of taking down the Berlin Wall, to fears of AIDS, to the popular movies of the year. I was in high school in 1987, so this book brought back a lot of memories. I found I could relate to what the teens of the story were going through since I grew up in the same time. And as a mother now, I could relate to the adults in the story as well. The characters were all very well developed and the storyline was compelling. The second half felt a bit like a soap opera at times, but it certainly kept things interesting! And just to warn you, this is the first of a series, so it will leave you wanting to know what's going to happen next ~ although some of the big events are wrapped up well enough not to drive you crazy. The dialog was a bit too formal; it didn't seem very natural at times. But the story flowed well, the characters were endearing and I definitely want to know what will become of this family in the future. If you're looking for an easy-to-read story about family and friendship, this is a good choice. Visit the author's blog and view the book trailer. 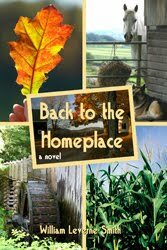 This review was written based on a copy of Back to the Homeplace that I received from the author in exchange for an honest review. Great review! I enjoyed this book too!! and reviewed it!! Hmmm. This definitely sounds like a book I would enjoy. Great review.